I was catching up on my backlog of magazines and last week’s reading material of the day was Lucky Magazine’s January issue. I came across Maya Brenner’s necklaces and immediately looked her up when I got back to work (perfect use of lunch time)! 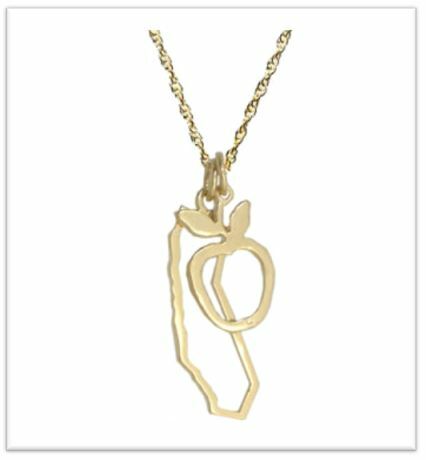 This is definitely a “Kristin” necklace – showing my love for my home state of Cali-for-ni-a and the Big Apple! (Maya Brenner is a native New Yorker but now lives in Los Angeles!) Bi-Coastal Necklace, ranges from $165-$400 and comes in gold or sterling silver. Lucky Magazine is offering a deal on these necklaces. Enter “lucky3” at checkout and get 35% off on all state necklaces from February 27, 2012!